A provisional agreement on key elements of Iran deal has been reached, say diplomats, according to AFP. Western diplomats in talks in Switzerland said Sunday that Iran had "more or less" agreed to slash the number of its centrifuge machines “by more than two-thirds” and to ship abroad “most of its stockpile of nuclear material,” according to the AFP report. Negotiators in Lausanne are frantically racing to finalize the outlines of a framework deal by midnight Tuesday, and the diplomats cautioned however that things may change. Iranian diplomats however denied that any tentative agreement on slashing the centrifuges and shipping out nuclear materials has been reached, telling the French press agency that any reports of specific number of centrifuges and exporting its stockpiles were "journalistic speculation". "The fact is that we will conserve a substantial number of centrifuges, that no site will be closed, in particular Fordo. 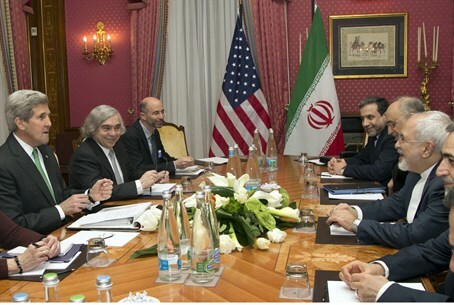 These are the basis of the talks," the Iranian diplomat said. A senior member of the Iranian negotiating team said that the "publication of such information by certain Western media is aimed at creating an atmosphere to disturb the negotiating process". Reuters and other news agencies did not carry the report, claiming instead only that serious progress had been made in the talks. regarding the core issues. Meanwhile, US officials said Sunday that the world powers seeking to pin down the nuclear deal with Iran were rescheduling their first full meeting with the Iranian delegation. A meeting, which had been due at 3:30 P.M. (1530GMT), "will be rescheduled due to scheduling issues," a State Department official said. US Secretary of State John Kerry, German Foreign Minister Frank-Walter Steinmeier, France's Laurent Fabius were still planning to sit down with China's Wang Yi and EU High Representative Federica Mogherini as well as their Iranian counterpart Mohammad Javad Zarif and political directors from Russia and Britain. "The West is being ​hoodwinked"
Israeli Prime Minister Binyamin Netanyahu has said the deal currently under discussion between Iran and world powers over Tehran's nuclear program is even worse than he had feared. "The dangerous accord which is being negotiated in Lausanne confirms our concerns and even worse," Netanyahu said in remarks at a meeting of his cabinet broadcast on public radio. Netanyahu also highlighted concerns over Iran's wider expansionist ambitions in the region via Shia Islamist proxies and other terrorist groups. "Even as meetings proceed on this dangerous agreement, Iran's proxies in Yemen are overrunning large sections of that country and are attempting to seize control of the strategic Bab-el-Mandeb straits which would affect thenaval balance and the global oil supply. "After the Beirut-Damascus-Baghdad axis, Iran is carrying out a pincers movement in the south as well in order to take over and conquer the entire Middle East. The Iran-Lausanne-Yemen axis is very dangerous for humanity and needs to be stopped." Defense Minister Moshe Yaalon also was quick to react to the reports of a deal, warning such an agreement, if true, would merely embolden Iran to be more aggressive. "A very bad deal could be signed in Switzerland with Iran, a country with a radical and out-of-control regime that succeeded in hoodwinking the entire western world," he added.